On Friday, April 17, the Maryland Robotics Center hosted a team from the Northrop Grumman Navigation and Maritime Systems Division (NMSD). The purpose of the meeting was to identify and discuss topics of mutual interest. The NMSD team toured the Maryland Robotics Center’s laboratories. 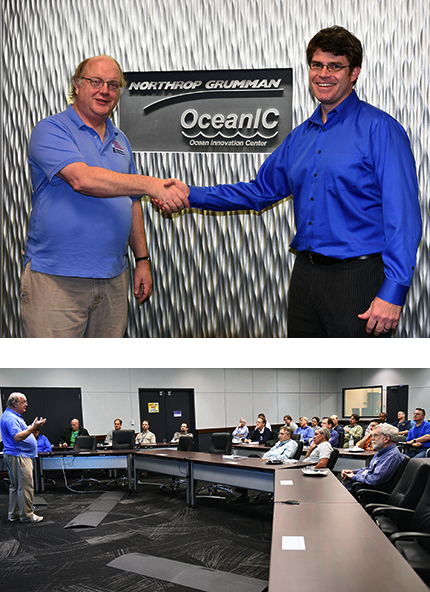 A follow-up meeting was held at the NMSD Undersea Systems site in Annapolis on Monday, April 20, where Prof. David Akin gave a presentation to the NMSD group on his research activities. Northrop Grumman is a partner with the Institute for Systems Research and the Maryland Robotics Center through its membership in the ISR Associate Partner Program.